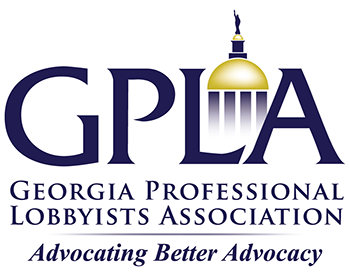 Welcome to the Georgia Professional Lobbyists Association (GPLA) website. Our mission is to promote the development of professionalism, competence and professional standards for advocates in the public policy arena. Lobbyists have been an integral part of our representative system of government since the founding of the Republic. There are lobbyists involved with the schools, churches, retail businesses, and corporate interests you see each day. Of course, each individual and business can go to the State Capitol on their own to ask the General Assembly to respond to their needs. However, professional lobbyists know the intricacies of the process — who to talk to, how and when to present an effective argument, and what needs to be done following. We provide elected officials information to equip them to weigh different viewpoints and then decide what is in the best interests of their constituents. GPLA is committed to promoting professional development and setting high standards for our members. We support transparency in lobbying activities and embrace a strong Code of Ethics for members to follow. We are in the process of developing a certification process for lobbyists that will ensure continuous education for our members. Thank you for visiting our site. Visit often to see what professional lobbyists are doing to improve citizens' access to their government.